"THE SURF FISHING CAPITOL OF THE WORLD!" 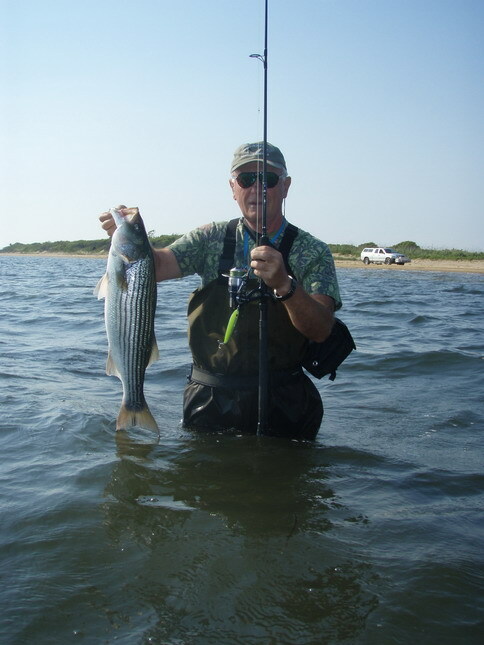 There are many surf fishing opportunities on Long Island - from quiet back bays, to the pounding surf and rocky shoreline of Montauk, to the sandy beaches of the South Shore. Each has their own type of structure, and provide the surf fisherman with vast opportunities. The following is a guide to help you customize your trip. Montauk is a surf fisherman’s dream. Here we can fish back bays, sand beaches, and go rock hopping all in the same trip. There are spots for every tide and every wind, so usually I can put you on to some fish. MAY In May the water temperatures are cool and the fish are migrating. May can be excellent depending on how consistent the weather patterns are. If it is trophy stripers you seek this is one of the best months. JUNE In June we usually see a good population of sand eels, and when the stripers find them fishing can be superb. Montauk gets overlooked by most anglers during May and June, and it’s a pleasure to catch fish without the crowds. I think of this month as the most consistent fishing of the year. JULY July can be a slow month due to high water temperatures and a lack of bait. Fish can still be picked on night tides, and every now and then some cows take residence in one of the many boulder-invested areas. The trick is finding them. the first two weeks of July can be prime time to seek trophies. AUGUST Ahhh August! This is perhaps my favorite month to fish. There is a lack of effort by other fishermen and cows to be taken for those surf rats that are willing to crawl on rocks, and take long hikes in the middle of the night to find the fish. If you plan to book Montauk in August I recommend that you already have some casting skills, and are in decent shape to take the long hikes, and do the required rock hopping. August is a night only trip in most cases. OCTOBER What can I say about these months? The bass and blues are migrating. The bait is everywhere. 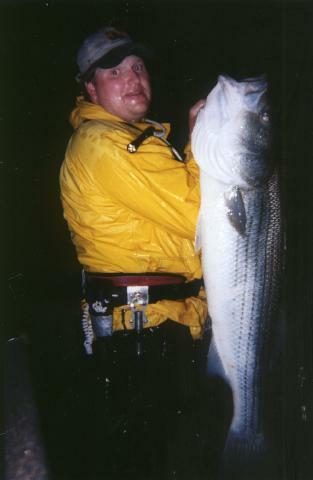 All out blitzes of stripers and blues are fairly common. What a time to be a Montauk surf fisherman!! NOVEMBER & DECEMBER These months were can be excellent especially for big fish, but they have been very iffy throughout the last decade. Wind and weather play a large role, and I may recommend another location if they are not conducive to catching fish. Long Islands South Shore is loaded with open sand beach and grassy back bays. Generally I take my charters from Long Beach to Robert Moses although an occasional special trip may be made to Smith Point or Shinnecock. I especially like to walk the flats of Shinnecock in May and June for some sight fishing. MAY In May the water temperatures are cool and the fish are moving in and out of the open surf, and back bays. If you book the South Shore in May we will probably bounce around from the light tackle back bays to the heavier tackle open surf, and you will get an education on both of these opportunities. JUNE In June I like to concentrate on the good run of weakfish. Many nights we will not move from spot to spot because I have found where the weakfish have been holding. Going in the back bays of the South Shore during June depends on the wind, and the mosquitoes, which can make things unbearable this month, so expect to fish mostly open sand beaches. JULY July is just an all around off month and the fishing is slow. If you book this month I recommend a late night tide. AUGUST I usually stay away from the South Shore in August because the North Shore and Montauk are so good. That’s not to say August isn’t good on the South Shore, I just prefer fishing elsewhere. OCTOBER Two excellent months on the South Shore! The fish are migrating and mullet, white bait, and bunker are getting pushed on to the open beaches. I am usually booked for Montauk on the weekends during these months, but available weekdays. If you happen to book during a Nor’easter it’s probably going to be more than a 6-hour trip because the fishing can be phenomenal. NOVEMBER I like to concentrate on the open beaches this month, as they can be explosive, especially in the Long Beach area. This is a month that I pound the South Shore beaches, as the fish push the peanut bunker right into the surf. I do a lot of blitz fishing this month and on some days we will follow the birds in my buggy for miles and miles. However, for those of you that are willing to bare the cold, we can target big stripers in the dead of the Novemberrrrrrrr nights! DECEMBER December can be iffy and is really day-to-day depending on the weather patterns. Yes iffy, but some of my best days and nights have come in December. Generally I tend to concentrate on the back bays of the North Shore. This is light tackle paradise and fly rodders are welcome. When I say light tackle I am talking 7-foot rods and 8 to 10 pound test line with a light-spinning reel. Most of these areas require some walking, but it is well worth it, as you will enter Back Bay gems in the way of marshlands that hold plenty of bait and yield plenty of bass. The Long Island Sound isn’t out of the question either as it has plenty of structure and plenty of bass. Some days we will enter the back bays and the Sound during the same trip. If you like quiet skinny water this is the trip for you. JUNE May and June are perhaps my favorite months to fish the North Shore as the back bays are loaded with bait. Bass key up on the mouths of draining marshes and the surface action can be great as the bass explode on surface plugs like pencil and Polaris poppers. JULY The back bays hold a good population of juvenile spearing in July. The fishing can be decent, but the fish are usually small 15" to 20" as the water temps are warm. AUGUST The snapper’s move in to feed on the loads of spearing during August, and when the striper finds them, it can be red hot for dusk, dawn and night fishing. My Back Bay plug of choice during August is the black and silver Red fin. It’s a rush to hear a stripers explode on those plugs in quiet back bay water in the middle of the night. OCTOBER September gets the nod over October for the back bays. During September the back bays continue to hold a good population of resident fish. By October it can be spotty and efforts are better spent in Montauk or the South Shore. Of course there are exceptions from year to year, week to week and even day to day. I’ll give you the scoop when you book or check out my reports. NOVEMBER The back bays are either void of life or will be very good if a population of fish has pushed or found bait in one of the Back Bay areas. Here again it’s day to day and I’ll let you know, or take a look at my report section.